With the rise of social media and the real-time web, the essence of now has never been more important.’a0 With recent events such as Balloon Boy, the Yankees winning the World Series, and so on – people want to know what’s going on, right now on the Web. This is where OneRiot comes into the picture. OneRiot’s search service gives you a feel for what the real-time web has to say about the most current information, links, and conversation about events as they happen across the web on Twitter, Digg, and other social sharing sites. However, what happens when you’re on-the-go and you want to search the real-time web on your mobile device?’a0 This is where Taptu, the touch friendly search engine for your mobile comes into play. Today marks a point in time where two innovators in search Taptu on the mobile platform and OneRiot on the real-time web, have come together to bring you a completely new search experience on your mobile device. By utilizing OneRiot’s realtime search API, Taptu has built a revolutionary real-time search engine that is tightly integrated into a mobile friendly touch interface. Taptu and OneRiot set out to take real-time search to the next level by helping you discover content on your mobile device. Think about the last time you were at a conference, concert, or otherwise in need of information as it happened on the web. You likely searched Twitter and other social websites for messages regarding the topic you were interested in, only to find yourself frustrated with the results. Now, with the partnership between Taptu and OneRiot, you can track the content – photos, links, articles, blogs, videos -‘a0 and other information shared as they happen on the real-time web, right on your mobile device. 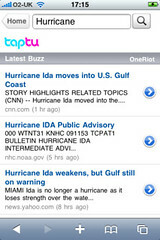 To check out the new offering, go to Taptu.com on your mobile device and select the Buzz category.’a0 There, you can see hot topics and hot content being shared on the web, right now.’a0 Additionally, OneRiot results are available in the cluster of regular Taptu search results. The new service works on devices such as the Apple iPhone and iPod Touch, BlackBerry Storm, Android G1 and the Nokia’a0 5800.’a0 More Touch devices will be added soon very soon so watch this space.’a0 Also, OneRiot’s realtime results will appear in Taptu’s Touch Search App on the iPhone and iPod touch imminently.